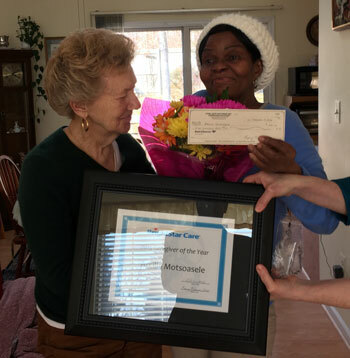 Caregiver of The Year Arcilia Motsoasele | BrightStar Care | BrightStar Care "
Arcilia Motsoasele (r) was awarded BrightStar’s coveted “Caregiver of the Year” award on Friday, February 5 at the home of her client, Madeline Rich (l). Arcelia was chosen from a very competitive field of caregivers to receive the award, and a $500 check, because of the dedication and caring she has shown in taking care of Madeline as a live-in caregiver this past year. Madeline commented that Arcadia “is an angel who goes everywhere with me. I cannot see very well anymore and having Arcadia beside me makes all the difference”. Madeline’s daughter, Ina, wrote us to let us know she feels her mother is both safe and happy at home now that she has Arcelia.